A new exhibit has sprung up to honour the inventions of Steve Jobs in Alexandria, Virginia. 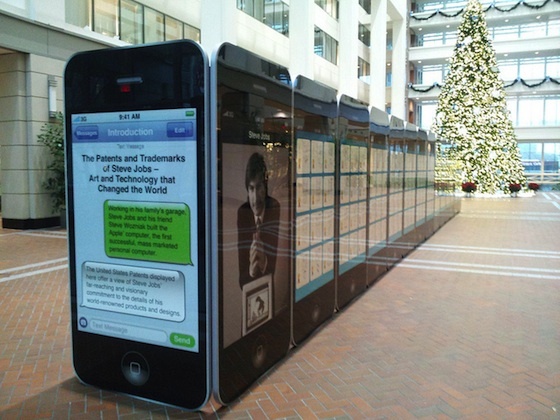 The US Patent and Trademark Office (USPTO) unveiled 30 massive iPhone-like models showcasing 300+ patents that lists Jobs as the inventor or co-inventor. It’s like a walk down memory lane for Apple aficionados. The exhibit, located in the atrium of the Madison Building, was created by the non-profit Invent Now, Inc., that also runs the National Inventors Hall of Fame and Museum, at the USPTO campus. The free patent exhibit will be on display until January 15, 2012.